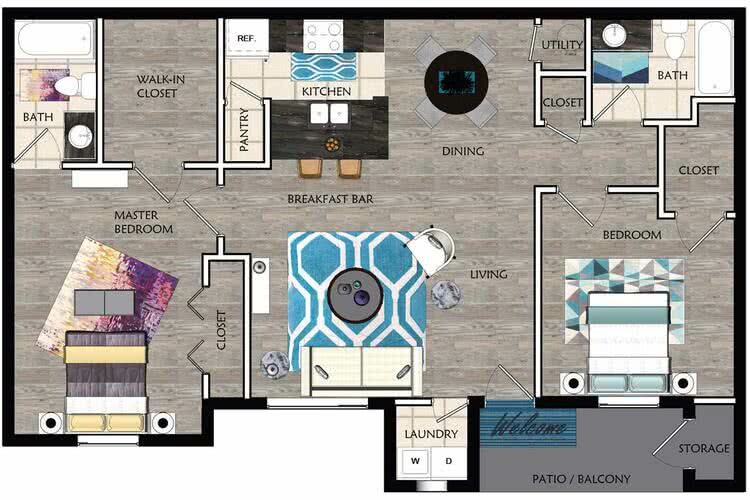 The Sapphire is our extremely popular two bedroom two bath floor plan. This floor plan comes complete with a laundry room with full size washer and dryer, huge walk in closest, a kitchen that opens to the living room and dining room and additional outside storage. This lovely 2 bedroom apartment in St. Cloud, FL includes stainless steel appliances, new white kitchen cabinets, granite style counter tops, and wood-style* flooring throughout. (*in select apartments).